Uranium waste from mining contains radioactive decay products which have the potential to effect surface, ground water, soil, and air quality in Greenland for thousands of years. November 1o, 2013—Greenland is a semi-autonomous part of the Kingdom of Denmark. It is located between the Arctic and Atlantic Oceans. Greenland’s ice sheet is approximately 660,000 sq. miles, which is about 80% of its surface, second only to the Antarctic Ice Sheet. Its thickness averages more than one mile. The current ice sheet in Greenland is approximately 110,000 years old and there has been a continuous ice sheet for over 18 million years. Greenland’s ice sheet contains valuable records and, according to Wikipedia, the data collected from the ice sheet is “greater than in any other natural recorder of the climate, such as tree rings or sediment layers.” But according to the satellite monitoring this ice sheet since the 1970’s, it has been steadily growing thinner. As stated in last week’s post by John J. Hidore, “As a result of the warmer temperatures, the ice has been thawing further from shore and the remaining perennial ice pack has been getting thinner. In some areas it is only half as thick as it was a few decades ago.” This melting of the ice sheet allows for passage of freighters, without ice breaker ships, to places that were previously inaccessible. China is currently the world supplier of rare earths but in 2013 China put a cap on the production of rare earths stating that overmining has created massive damage to their environment and China “no longer wants to pay the environmental costs of supplying the vast bulk of the world’s rare earths,” as reported by David Stanway. There has been little or no regulation of the mining of rare earth metals in China, leading to many environmental disasters. For example, in Northern China near the Mongolian border radioactive water from a mine is leaking into the Yellow River, which is a major source of drinking water and in south-central China, there are a large number of illegal rare earth strip mines. In southeast China, runoff from rare earth mines are destroying rice fields and water sources. Forty-eight NGOs (nongovernment organizations), including Greenpeace, have signed a petition to stop mining in Greenland. The reasons they have listed include: 1.There will be chemical pollution from radioactive tailings. 2.There is no safe technology to store radioactive residues. 3.The Arctic environment is vulnerable to pollution, as it is extremely slow to recover due to the cold temperatures which slow down the chemical breakdown of the contaminants. 4.Up to 85% of the radioactivity from uranium mining will remain in the tailings and leakage is highly possible, spreading the radioactive materials throughout the pristine environment. 5. As in the mining of rare earth metals in China, leakage of radiation may accumulate in the food chain, thus contaminating fish and causing genetic damage to life in the Arctic. 6. 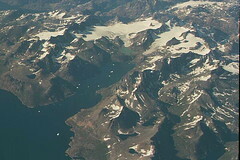 Contamination could eliminate the fishing industry of Greenland. Categories: Climate Change | Tags: Arctic, China, Denmark, Greenland, Greenland minerals and energy, Non-governmental organization, Rare earth element | Permalink.